Conjunctivitis, commonly known as “pink eye,” can be a real pain in the eye. You might be wondering “Can dogs get pink eye?” The short answer is yes, dogs can get pink eye. How a dog’s eye or eyes become infected can be the result of a virus, bacteria, foreign body, parasite, or allergies. With so many ways for your pup’s eyes to become infected, treatment varies. Pink eye, in both humans and canines, is an irritation or inflammation of the white part of the eyeball called the conjunctiva. The most common symptom is redness, which is why conjunctivitis is called pink eye. A dog’s eye, however, is different from a human’s eye because the conjunctiva is usually less visible. The telltale sign of redness in the eye can be missed even if you spend hours lovingly staring into your dog’s eyes. But there are other symptoms of canine conjunctivitis that you can look out for. Also, if you see your dog consistently pawing at his eyes, that probably warrants a trip to the vet to rule out pink eye or some other problem. If you suspect that your dog may have pink eye, it is important that a veterinarian conduct a complete eye exam to rule out other eye disease as well as properly check for conjunctivitis. The most obvious symptom, however, is any unusual behavior by your dog related to his eyes. We all know how our dogs behave “normally,” so don’t ignore strange behavior. Your dog is probably trying to tell you something. Keratoconjunctivitis sicca (KCS) also known as canine dry eye. Like human dry eye, this impairs a dog’s natural ability to produce tears and keep the eyes properly lubricated. Is Dog Pink Eye Contagious? In general, canine conjunctivitis can be either contagious or non-contagious. Contagious conjunctivitis is caused by bacteria, a virus, or sometimes a parasite while non-contagious conjunctivitis is caused by allergies or an eye injury. While contagious conjunctivitis is rarer for dogs, the disease is believed to be contagious. It can be spread through casual contact with the infected eye or infected discharge. Less clear is whether the disease is species specific. So can you give pink eye to your dog? According to some pet health professionals, dogs can get pink eye from humans. So, keep your infected eye discharge away from your dog! 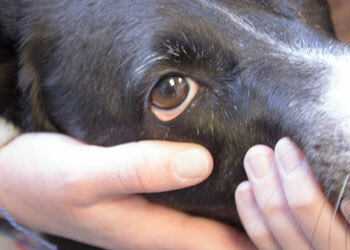 Pet care professionals, however, are less certain that humans can contract pink eye from dogs. In other words, they don’t see “eye-to-eye” on this issue. As for dog-to-dog transfer of pink eye; just like their two-legged friends, canine conjunctivitis is generally believed to be contagious between dogs. Dogs, like humans, can spread pink eye when they come in contact with infected secretions that contain the bacteria or virus causing conjunctivitis. We can all agree, however, that good overall pet care will reduce the chance of your dog contracting pink eye as well as disease in general. That includes a good diet, plenty of exercise, routine vaccinations, and regular grooming. Also, spaying or neutering your dog is generally believed to provide general health benefits to your pet. Routine care coverage offered through pet insurance can help reduce the cost of these routine checkups. Another good habit is to wash your dog’s face to remove debris and always wash your hands after contact with your dog’s face, food and water bowls, and toys. As with cases of human pink eye, bacterial conjunctivitis in dogs is difficult to prevent since bacteria is everywhere and the eyes attract bacteria. Keep the area around your dog’s eyes clean and make sure to remove any discharge or crusting from the eyes. Most dogs will have some discharge or crusting. Pay attention to how your dog’s body works and be on the alert for unusual discharge. This can look different in color or there may be more discharge than usual. Generally, if your dog is diagnosed with bacterial conjunctivitis, the treatment will likely include antibiotic eye drops or ointment prescribed by your vet. Administering any type of medication, particularly eye drops, can be challenging. Make sure to ask your vet for tips to properly give your dog the eye drops. Also, discuss treatment options so the veterinarian can identify the best type of medication for your dog. Most antibiotics can be administered in different forms including eye drops, ointments, and pills. Similarly, viral conjunctivitis is also difficult to prevent and can result from a cold or respiratory infection. The best defense against viral conjunctivitis is to ensure your dog is healthy overall. Proper diet and exercise so your dog’s natural immune system stays strong can help keep them healthy. However, if your dog is diagnosed with viral conjunctivitis, the treatment will likely consist of steroid eye drops and perhaps artificial tears to help keep the eyes clear of discharge or crust. This will also ease your dog’s discomfort as the medication kicks in. Not surprisingly, the treatment for canine conjunctivitis will depend on how your dog developed pink eye. If eye drops are prescribed, there are several ways to help administer the medication properly and safely. First, clean the area around your dog’s eyes. Second, hold the dog firmly and close to your body, so the dog cannot move. You may need assistance to restrain your dog. A familiar family member or friend is ideal. Proper restraint will not harm your dog; and in fact, will help prevent injury. Next, wrap one arm around the dog’s shoulder and use your arm to lift the chin upward so the eyes are looking up. With the same hand, gently open the dog’s eye by pulling the eyelid downward to create a little pouch below the dog’s eyeball. Administer the number of drops as prescribed into the pouch. Be careful not to let the tip of the bottle touch the dog’s eye. Finally, let the dog go. His natural movement and blinking will cause the medication to spread evenly over the eye. Don’t forget to wash your hands thoroughly before and after administering eye drops and remain calm. Dogs can react to a human’s mood, so approach this task with the right mind set and your dog will follow your lead. Of course, this may require some practice as you and your pet get comfortable with the process. Always ask your veterinarian for advice and make sure to consider your dog’s age, size, health and overall demeanor when you administer medication. Don’t let the challenges of administering eye drops or medication get in the way of proper treatment. Make sure the proper dosage is actually getting administered, so keep your eyes open! Some dogs develop pink eye due to allergies. Make sure you are taking steps to keep your house free of dust, dander, pollen and mold which can trigger allergies. Learn to identify irritants that trigger your dog’s allergies such as perfumes, smoke, foods, grass and plants. Just like humans, keep your dog’s eyes clean of dust, dirt and other particles that cause eye irritation. If allergies lead to pink eye, your veterinarian will probably prescribe an antihistamine or an anti-inflammatory drug as well as steroid eye drops and artificial tears. A cold compress will help relieve irritation for cases of canine conjunctivitis due to allergies. If your dog experiences pink eye due to an injury, foreign object, or debris infecting the eye, it is important to have a veterinarian examine your dog to ensure there is no damage to the cornea. An injury to the cornea is very serious and may be cured with medication, but could also require surgery. Most importantly, medications for pink eye may worsen an injury to the cornea and could cause blindness. It is important to consult with a pet care professional before administering any medication. It goes without saying that you should avoid diagnosing and treating your dog unless you are qualified. Also, medication for humans, including eye drops, are generally not the same for dogs. You should never treat your dog with human medication without consulting a pet care specialist first. Using the wrong eye drops could cause significant pain, damage, and blindness. After the proper diagnosis and treatment plan has been identified, make sure to follow veterinarian instructions. Also make sure your dog does not paw, scratch or rub the affected area. Of course, the dog will want to do this, so you may have to use a cone to protect your dog from causing harm. Chronic conjunctivitis may require additional diagnosis by your veterinarian particularly if there is no obvious cause for each flare-up. This may require a bit of investigation on your part to record some day-to-day information and possible causes for the infection. Providing this information to your veterinarian will help identify a proper treatment. Chronic pink eye can cause more serous conditions as deeper layers are affected and other parts of the eye can be damaged by recurring conjunctivitis. Moreover, your dog is probably uncomfortable with each bout of pink eye. Unfortunately, canine conjunctivitis is fairly common. Also, your dog may have pink eye or pink eyes; so, don’t be fooled if symptoms appear in only one eye. Usually when conjunctivitis is found in both eyes, the cause is a virus. When conjunctivitis is present in only one eye, it could be due to irritation, dry eye, or an infected tear duct. Once treatment begins, improvement can be seen within a few days in most cases, but full recovery for some cases may take up to three weeks. More importantly, your dog will find relief almost immediately after eye drops are administered. As with most diseases, some breeds are more prone to conjunctivitis than others due to hereditary factors or physicality. Poodles and Cocker Spaniels have a congenital predisposition to conjunctivitis and should be tested early (even before symptoms appear). Other breeds including Pugs and Pekingese are more susceptible to conjunctivitis due to their facial features. These features make their eyes more vulnerable to foreign bodies and irritants in the air. 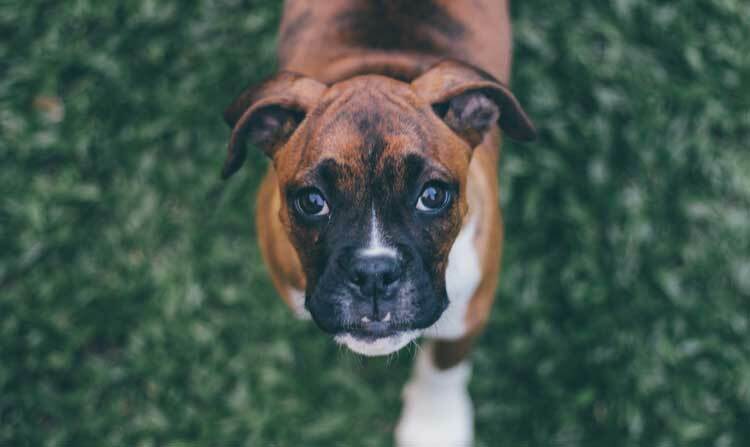 All of these breeds may require special attention to their eyes to prevent conjunctivitis as well as other diseases of the eye.